This page is a general discussion of statistics of Florida hurricanes. It only encompasses from 1900 to 2000. Please consider for true statistical analysis the population of 100 years in geologic time is not a representative sampling. At the same time relatively good data has been collected for the past 100 years and is getting better each year. The resolution of these maps are purposely reduced for faster downloading as appearance is not critical for the content portrayed. The first presentation is a set of 11 charts showing hurricanes for each decade that have made landfall on the coast of Florida. For the Keys the two significant hurricanes were the hurricanes of 1906 and 1909. The 1906 was the inauguration of the Florida East Coast Railway (FEC) into building the Key West Extension. House boat number four docked at Long Key broke loose and washed out to the reef and broke apart. At first all were thought lost; however, many were picked up by passing boats and saved. Florida has about 400 miles of Atlantic coastline and 800 miles of Gulf of Mexico coastline. Of the four hurricanes striking Florida's 1,200 miles of coastline, 50 % were in the Keys. The shape of Florida makes it unique since it can be impacted twice by the same hurricane as in 1903, but there were six years without a hurricane. The third hurricane to haunt the construction was the hurricane of 1910. After the disastrous 1906 hurricane, the FEC evacuated many of their workers and built protected harbors for its floating equipment. This decade 29 % of the seven hurricanes were in the Keys. The 1919 hurricane was the worst hurricane of the twentieth century, but the earlier hurricane of 1846 was its worse. This decade there were four years without a hurricane. Percentage wise the Keys were much better off than the rest of the state with only one of nine hurricanes making landfall in the Keys. Our neighbor to the north, Miami, however experienced its worst hurricane of its recorded history. The Florida building boom was dying but the early September hurricane surely doomed it for Miami. Two thousand housing were destroyed and 113 people confirmed dead. Dinner Key in Biscayne Bay reported a 13.2 foot tidal surge. In the 1930s there were six years without a hurricane, but this was the decade that prompted this web page. There were two hurricanes in 1935, one in the Keys and one just north. The Labor Day Hurricane of September 2 is the main focus and will be discussed at length later. The second hurricane of 1935, known by some as Hurricane Yankee, striking the Fort Lauderdale area struck fear for those in the Florida Keys. Two hurricanes made landfall twice. The 1940s were hurricane years for the Keys, a total of 10. Only three years without a hurricane and two years in a row there were two. However, during most of WW II in 1942 and 43 there was not even a tropical storm. In the 40s highway US-1 was improved, and public electricity and drinking water were finally a part of then Keys living. When WW II was over, residential and business growth became a part of life. The war had perfected RADAR and better electronic communications. The 1950s started out to be as bad as the 1940s, but was a good decade for Florida. A total of four and none in the Keys. Seven years without a single hurricane, and it was the year that names were given. No hurricanes in the Keys and new residents moved to the Keys. One thing that attracted new residents and also retained older residents with children was the opening of Coral High School in 1952. Television antennas began to be seen on house roofs. In 1958 names were assigned at becoming a tropical storm. The 1960s showed what life in Hurricane Alley was like. Only the Lower Keys were spared. And for Florida, there were three hurricanes in one year - 1964, plus Donna counted as two - striking the Keys and the west coast. Even worse, Donna was a category 4 hurricane bringing with it significant storm surges throughout the Middle and Upper Keys. Donna signaled the beginning of stilt houses for lower elevations. Betsy is a kind of hurricane we in the Keys should be aware of. It was tracking safety northward and well past the Keys out in the Atlantic when it did a loop and headed southwest to come back to strike the Upper Keys. As far as totals, the 1970s were the best years of the twentieth century. The winds and storm surges of Hurricane Donna and Betsy were quickly forgotten. These hurricanes made land very inexpensive and growth became rampant in the Keys. The cheapest land were the wetlands and it could be dredged and filled for housing developments. Huge projects were on the books and the state stepped in and designated the islands of Monroe County as an Area of Critical State Concern in 1974. In 1968 the National Flood Insurance Program (NFIP) was created as a purely voluntary program In 1773 legislation imposed severe economic sanctions on communities that did not participate. In 1974 Monroe County joined and mortgage companies made it mandatory to have flood insurance. FEMA was given regulatory jurisdiction. If the 70 were good, the 1980s were better. There was one slight scare when tropical storm Floyd winds exceeded 74 mph right at the Tortugas, but it never strengthen much. In fact, many believe it dropped to tropical storm winds part of the time. There were eight years without a hurricane. In fact, the last real hurricane was in 1966 and Inez was not bad - Betsy in 1965 was! Betsy was the Keys last major hurricane being a category 3. Florida began to feel like a hurricane state once again in the 1990s. First, it was the strong category 4 hurricane Andrew in 1992 causing the largest dollar amount of damage ever. Fortunately, it passed a little south of metropolitan Miami, but like any category 4 hurricane it wreaked havoc. Not counting Hurricane Floyd, hurricanes Georges and Irene were the first Keys hurricanes since Hurricane Betsy in 1965. Before proceeding with Hurricanes by the month and to allow space for images, a small hurricane location/tracking is provided. Click the thumbnail chart to enlarge, then the back arrow to return. 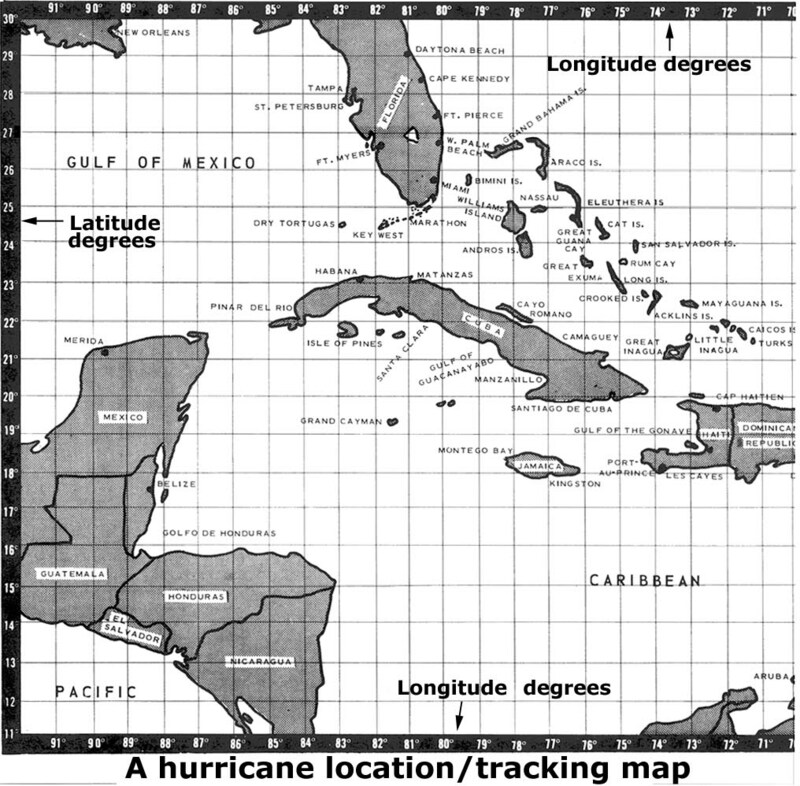 Longitude and latitude coordinates are needed to track hurricanes. Colored pens or stick pins also work well. A log of time, date, wind and other information is suggested. The chart should print on regular paper. The chart had no distance scale, but for an approximation, there are 70 miles between one degree of latitude. Also it is about 440 miles from Miami to the eastern edge of Acklins Islands in the Bahama Islands. The previous decade data is good historical or trend data, but hardly useful in day to day life. The following have both uses. The official hurricane season runs from June through November; however, most of the hurricanes occur in September and October as will be seen later. The following maps will depict the same hurricanes of the previous maps, but by the month in which they occurred. The thing the author wishes to point out in June is that four of the five hurricanes came up from the south or originated in the western Caribbean. The directions which the hurricanes approach are generally easterly by the end of July. However, it is now two months into the six month hurricane season, of which there were 59 hurricanes in these 100 years, and only eight or 13.6 percent of the hurricanes have made landfall. Almost twice as many hurricanes made landfall in August as did the previous two months. They are now all approaching from the south east. Of the 59 total, 15 or about 39 percent, have now made landfall at about mid-season, one of these being Andrew on August 22, 1992. The ancient mariners poem of "August - look out you must" is indeed good advise. The recited "September - Remember" from the Mariners poem is apropos for this month. Over time the months run together, but September is Hurricane Month in Florida. In the 30 days of September, eight more hurricanes made landfall on the Florida coast than in the past 92 days of June, July and August. The total hurricanes for the twentieth century is now 38, or 64 percent of the 59. October is to be remembered also. It had two more hurricanes that June, July and August had in total (15) and only five less than September. By far the majority of the hurricanes are once again approaching from the south and south west, or the western Caribbean. These hurricanes can be relatively near the Keys without the customarily weeks of notice. Of the 59 hurricanes, 55, or 93 percent of the hurricanes have made landfall. The six Category 4 hurricanes were Andrew (1992), Donna (1960), 1947 Lake Okeechobee), 1928 (Lake Okeechobee), 1926 (Miami) and 1919 (Key West). Any Category 4 or 5 hurricane must be given total and absolute respect. ( 7 - 24 - 2001) The following names of Atlantic Hurricanes will not be used to name another hurricane. The date in ( ) indicates when retired. Hurricane strength and dollar expense were considered; however, the dollar expense appears to have a more significant consideration. - Agnes, 1972; Alicia, 1983; Allen, 1980; Andrew, 1992; Anita, 1977; and Audrey, 1977. - Betsy, 1965; Beulah, 1967 and Bob, 1991. - Camille, 1969; Carla, 1961; Carmen, 1974; Carol, 1954; Celia, 1970 and Connie, 1955. Note, Carol was used again in 1965, but retired retropectively to 1954. - David, 1979; Diana, 1990; Donna, 1960 and Dora, 1964. - Elena, 1985 and Eloise, 1975. - Flora, 1963 and Fredric, 1979. - Gilbert, 1988 and Gloria, 1985. - Hattie, 1961; Hazel, 1954; Hilda, 1964 and Hugo, 1989. - Ione, 1955 and Inez, 1966. Return to General History Homepage, Click HERE.